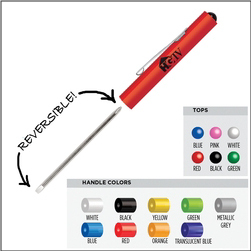 Order Custom Reversible Tip Screwdrivers with your business name or event logo message imprinted on them. These popular easy to change screwdriver tips come with 17 different tip options available for the specialized industry or application required. Great for computer and tech repair, automotive shops and businesses, handyman and fix-it businesses, trade show giveaways, among many other industries and applications! Multiple handle and button colors available. Order your custom tip reversible screwdrivers today!